Place Real California skim milk in a microwave safe measuring cup and heat just long enough to warm the milk. (This will reduce cooking time). In a medium saucepan, combine eggs, sugar, lemon zest, and cornstach. Beat with a whisk until the sugar is dissolved and the mixture is smooth. Place the pan over medium-low to medium heat and gently whisk the warm milk into the egg mixture. Take your time and continue to whisk during the cooking time until the mixture comes to a full boil and thickens (Takes about 15 to 20 minutes). Boil for one minute then remove from heat. Stir in Real California butter and lemon juice. Allow to cool completely, for at least 2 hours in the refrigerator. 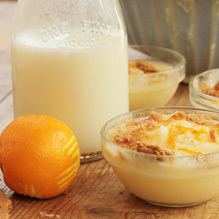 To serve, layer lemon pudding and graham crackers in small glasses or bowls, finishing with graham crackers. Top with lemon zest and sea salt. Do Ahead: pudding can be made 3 days ahead. Store in refrigerator.